So What Happens if You're Already Married? So you already went and signed the legal paperwork and although you are technically married you want to still celebrate your marriage with friends and family? Regardless of how you may have come to find yourself married prior to your wedding day there are a few things that it will affect during your ceremony. Under New Zealand law celebrants are unable to make it look like a marriage has taken place when it hasn't. We're not a bunch of party poopers who want to spoil your day (if anything we love a good party! ), but we could lose our licence to marry people if we were found to be doing so. We are however allowed to conduct a "commitment ceremony" while this may, in fact, look like a marriage ceremony to an untrained eye as long as certain words and phrases are avoided then we can still help you to celebrate the love you share and the commitment you're making in front of family and friends. 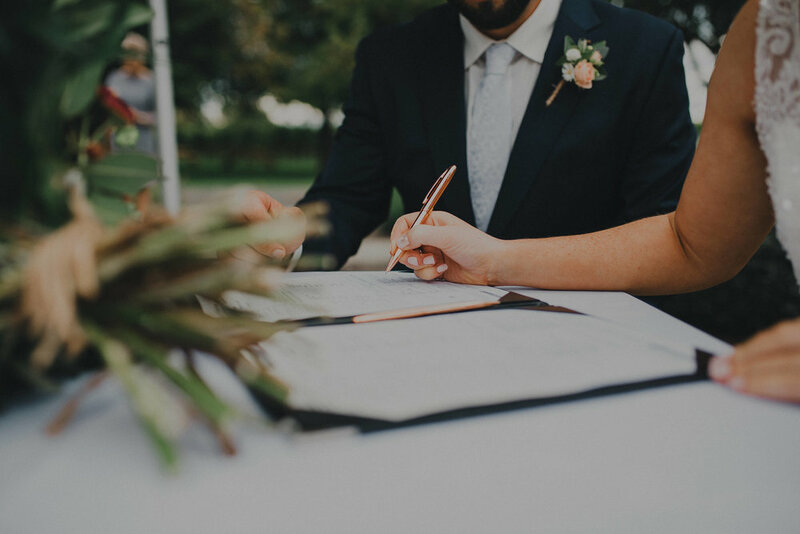 Once again we can't undertake any activity that might be seen as fraudulent, and you can't sign a fake marriage licence, but you can sign and certificate of commitment (or something similar). I've had a couple who decided to tell their guests as part of the ceremony, that although they had taken care of the paperwork earlier, they were excited about their wedding day and looking forward to sharing it with them. This way it avoids any awkward conversations and stops it from coming out later. Sometimes couples think that because the paperwork has already been taken care of it might be cheaper. For me I still see your ceremony as being equally as important as any other, paperwork or not, and want to make it equally as amazing so therefore it costs the same as any other ceremony. Although you might not be able to have a 'fake wedding' there are options. Have a chat to your celebrant and see what you can come up with to make your ceremony amazing!